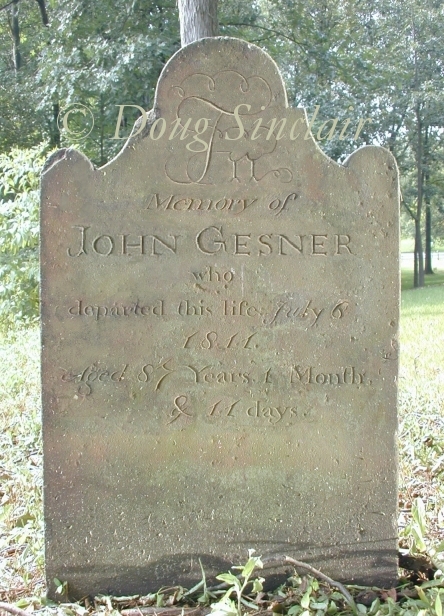 This is a recreation of John's gravestone, which once stood in the Gesner family Cemetery in Rockleigh, NJ. The small photo to the left was published in Anthon T. Gesner's genealogy when the stone was still there (it has obviously was enhanced before being published). The gravestone of Jacob Conklin still stands in the cemetery, and when compared to the old photograph, it is clear it was carved by the same hand and in exactly the same style. It also has the same phrasing and many of the same numbers. Based on the old, published photograph and a modern photo of Conklin's stone, computer technology and some artistic effort allowed for the image above to be created. In the Name of God Amen, I John Gisner of Harrington Township County of Bergin and State of New Jersey, being of sound mind and memory do make and publish this as my last will and testament. First, my funeral expences and all other lawful debts must be paid by my executor out of my personal estate. Second, I give and bequeath unto my son John Gisner and to my daughter Famica the wife of Peter Woolsey my lot of salt meadow to them their heirs and assigns forever, to be divided equally between them, John to have the North half and Famica the South. Third, I give and bequeath the residue of my personal estate after my debts are paid as above mentioned to all my children to be divided between them in the following manner and proportions. My executor will make out an estimate of the residue of my personal estate and then give unto my sons John and Nicholas and to my daughters Famica and Elisabeth the wife of Jacob Concklen each and equal share, and to my sons Henry, Abraham and the children of my son Isaac their father share (that is to say a share equal to that of Henry and Abraham). The shares of Henry, Abraham and the children of Isaac to be each of them only half as much as the shares of my sons John and Nicholas, and my daughters Famica and Elisabeth I give the same to them their heirs and assigns forever, and further I give and bequeath unto the children of my son Cornelius Gisner a third part of a share to which my sons John and Nicholas or my daugthers Famica and Elizabeth are each entitled to them their heirs and assigns forever. Fourth, I exonerate and discharge my son in law Peter Woolse from the payment of intrest on his bond which may be found against him after my decease. Fifth, I direct that my blood beads(1) shall be left in the posession of my daugter Elisabeth for the use of such of my children as may stand in need of them. Lastly, I name, constitute and appoint mmy trusty friend Jacob Outwater my sole executor of this my last will and testament and do empower and authorise him so to apportion and make division among my respective children their different shares herein bequeathed in such manner as conceives and knows was my desire and wish, and I do hereby revoke all former wills by me made. In witness whereof I have hereunto set my hand and seal the seventh day of May in the year of our Lord one thousand eight hundred and ten. 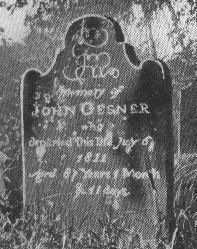 The will was brought to court on 11 July 1811.
vital records sources: John's birth is calculated from his gravestone. His marriage is in the New York City Lutheran Church records? as having taken place the 5th Sunday after Easter 1744. According to the Julian Calendar being used at the time, Easter was on 5 April in 1744. On our modern Gregorian Calendar, the day would be 16 April. The fifth Sunday after Easter in 1744 was the 10th (Julian) or the 21st (Gregorian) of May. 1. "Blood beads" undoubtedly refers to a devotional practice of healing, similar to Rosary beads. Little has been found to explain specifically what they were, but it is also likely that they were meant to represent the blood of Christ, and were not literally composed in any way of blood. The Rosary was not exclusively a Catholic ritual, but was also used, although not nearly as commonly, by Lutherans and other denominations. So far removed as it would have been by Lutheran/Dutch Reformed residents of New York/New Jersey in the early 1800s, the prayer ritual involved was surely not the same as the Rosary, but similar in concept. Having been bequeathed specifically in this will, they undoubtedly had great importance in the family and may have been passed down through his Lutheran forebears.